VEKAdeck's® low water absorption property makes it ideal for high humidity, pool or marine environments. Maintenance is reduced to periodic cleaning with mild household soaps. Standing water should be removed to prevent mold, mildew and dirt build up. Since VEKAdeck is made from 100% PVC and color stabilizers, this premium deck board will resist fading due to normal weather conditions. Gradual, uniform color change may occur and is normal, but VEKAdeck will display an attractive appearance season after season. Our reinforced cellular PVC extrusion process gives VEKAdeck dimensional stability and impact resistance. 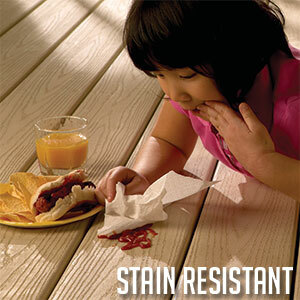 We are so sure of our process that we warrant VEKAdeck not to rot, chip, peel, blister or corrode. View our cleaning guidelines for VEKAdeck.